SiliaMetS Thiol and Thiourea both outperform activated carbon (Darco) and polymer-based scavengers (Quadrapure) in the palladium scavenging from a drug candidate. An improved route was designed to synthesize kg-scale quantities of GDC-0084, a drug candidate which showed promising results in the treatment of various brain cancers. The new route was plagued by a high level of palladium contamination (2400 ppm) leftover from a Suzuki cross-coupling. 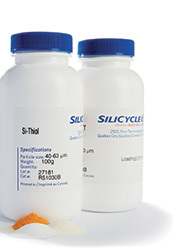 Using either SiliaMetS Thiol or Thiourea, a very low concentration (≤ 16 ppm) could be reached, much lower than what Darco or Quadrapure could achieve. A second generation route used 10 wt.% of a mixture of Si-Thiol and Si-Thiourea to reach 10 ppm of Pd on 7.7 kg scale. SiliaMetS Metal Scavengers are functionalized silica gels designed to react and bind excess metal complexes. Silica-based metal scavengers have been proven to be the purification method of choice over all other methods and several companies from various industries use them. SiliaMetS are highly selective and offer a cost-effective alternative for metal scavenging. SiliaMetS Thiol (Si-Thiol) is a robust metal scavenger for a variety of metals including Pd, Pt, Cu, Ag and Pb under a wide range of conditions. 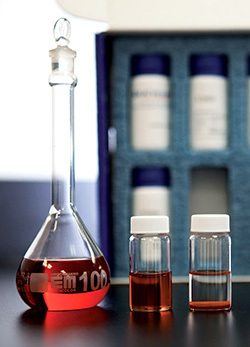 It has been used in pharmaceutical processes up to the pilot plant scale. It is our most versatile metal scavenger and is the preferred metal scavenger for Pd(II), Cu, Ag, and Hg. SiliaMetS Thiourea (Si-THU) is a versatile metal scavenger for all forms of palladium and is widely used in the pharmaceutical industry. It works particularly well in organic solvents. It can also be used to scavenge Ag, Pt, Ru, Rh and Hg. Once complexed with a transition metal, it has been reported as being an effective catalyst.